The 2019 State of Technology Luncheon has been scheduled! The luncheon will be April 26th, 2019 at the Seattle Sheraton. Sponsorship and RSVP details are included below. The State of Technology Luncheon is held each spring in downtown Seattle and is the Technology Alliance's largest annual event. Each year, the luncheon brings together 1,000 leaders from business, government, education and research to celebrate Washington's progress in building a vibrant innovation-based economy and gain perspectives from globally recognized leaders in science and technology. Sponsorship Packages range from $2,000-$20,000. Please click here for detailed sponsorship information and reach out to events@technology-alliance.com for further information or to sign-up for a sponsorship. 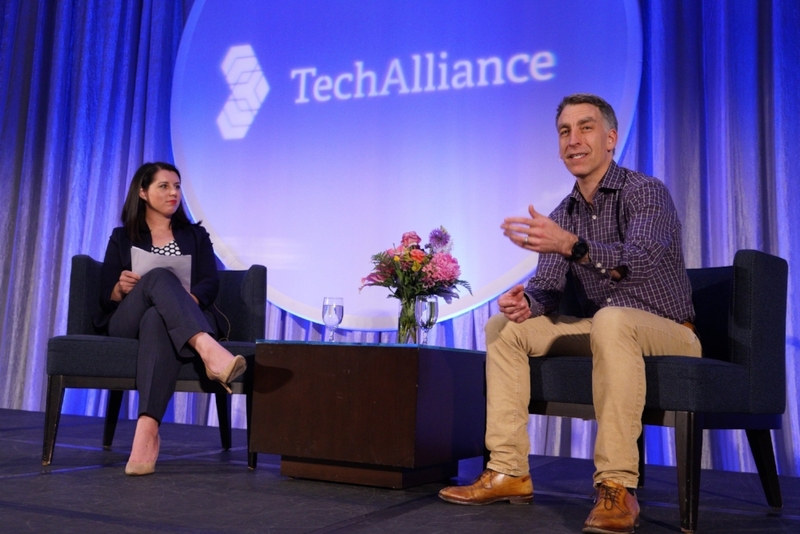 More than 750 regional executives and leaders from business, education, research, and government joined Redfin CEO Glenn Kelman at the Technology Alliance’s annual State of Technology luncheon at the Seattle Westin. The event also featured three local companies - Loftium, Blokable, and Quadrant Homes - using technology to change housing and our homes. Both Redfin and Blokable recently won GeekWire Awards, Redfin for IPO Deal of the Year and Blokable for best new hardware. Kelman was interviewed by Streem Chief Revenue Officer Liz Pearce (formerly CEO of LiquidPlanner), who is also a board member of the Technology Alliance. The conversation covered a wide-range of topics with Pearce and Kelman discussing the challenges of leadership when the country seems divided both ideologically and economically, maintaining an entrepreneurial culture in a larger organization, and the growing role that technology companies play in shaping the region and our society at large. 22% - Current demand for STEM workers met by in-state STEM degrees awarded over 10 years. 19th - National ranking for our private investment in higher education R&D. Showcasing the region’s entrepreneurial spirit, three local companies using technology to change different aspects of the housing market each also shared their stories. Yifan Zhang, CEO & Co-Founder of Loftium, shared that startup’s approach to using Airbnb income to help first-time home buyers afford a down payment. The Seattle region is Loftium’s first market. Loftium provides creative new entry points for first time home buyers traditionally priced out of high-demand housing markets like Seattle. Aaron Holm, Co-CEO of Blokable, discussed the company’s modular, smart housing units. And though recently recognized for their hardware, Holm highlighted the efficiencies that come from their wired panels and smart home technology. Blokable is an innovative provider of affordable housing that meets both acute and long-term community needs by significantly shortening the planning, permitting and building cycle for a range of housing options. Ken Krivanec, President of Quadrant Homes in Washington, provided the sizzle the audience was looking for when he highlighted the HomeSmart features that now come standard in most Quadrant Homes. From energy efficiency, to appliances connected to your phones, to security systems - Quadrant’s homes bring together some of the best technology (much from other local companies) that will change what we expect from our houses. The organization’s CEO, Carol Rava, closed the event noting the power of the cross-sector leaders in the audience and their collective ability to lean into strengthening the region’s technology and innovation ecosystem.